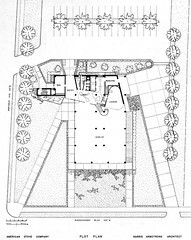 Site plan (with building interior). The ground floor plan with site design for Harris Armstrong's Magic Chef Building (1947). The plan makes clear the angled walks leading to the main entry from the East and the West. The outline of Noguchi's sculptural ceiling is shown with dotted lines in the Lobby. Kingshighway runs across the bottom of the drawing with North being toward the right. The angled drive on the North side leads to the inset loading dock. Parking is provided on the West side of the building.